Christmastime is sweets time! Hi Doodlebug fans! Kathy Martin here today to share a gift giving idea with you...treats in a jar. 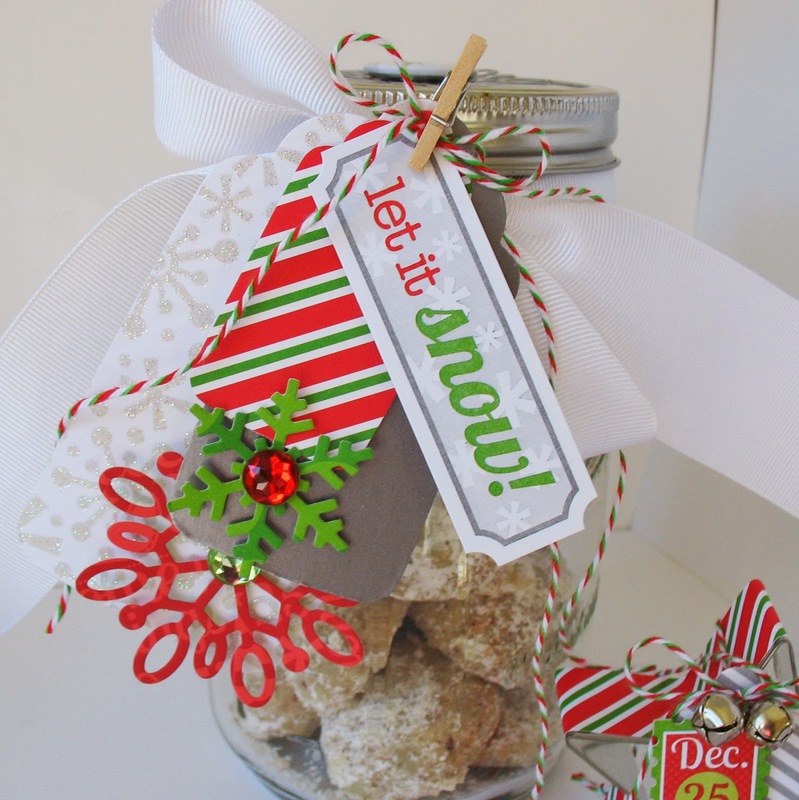 Whether you whip up something in your own kitchen or fill a jar with your favorite candies, these goodies make delicious gift for your neighbors! I filled this jar with home-baked snowballs, otherwise known as pecan balls. These irresistible powdered sugar dusted cookies are a household favorite! And I love how easy they are to make, requiring just a few ingredients! Heat oven to 375 degrees. Beat together butter and sugar. In a food processor or blender, finely grind pecans and add to butter mixture. Mix in flour 1/2 cup at a time, being sure to scrape down your bowl. Add vanilla. Using a tablespoon cookie scoop, scoop balls onto a lined cookie sheet then roll gently in palms to make round. Bake for 11-12 minutes, until slightly browned. Cool for about 10 minutes before rolling in powdered sugar. Doodlebug's Home for the Holidays glittered snowflake paper and the 'let it snow' tag matches my snowball cookies perfectly! Here's the lid. Cute, huh? Love the badges! Some years I make ornaments to go with my treats...something to hang on the tree and enjoy year after year. Using the same papers and snowflake theme as the goody jar, I decorated this star shaped cookie cutter. I simply used a foam brush to apply a thin layer of Aileen's craft glue around the edge of the star and applied a strip of patterned paper. Then came the decorations...tag and snowflake die cuts along with a sticker, rhinestone, baker's twine and jingle bells. That's it! Super simple! 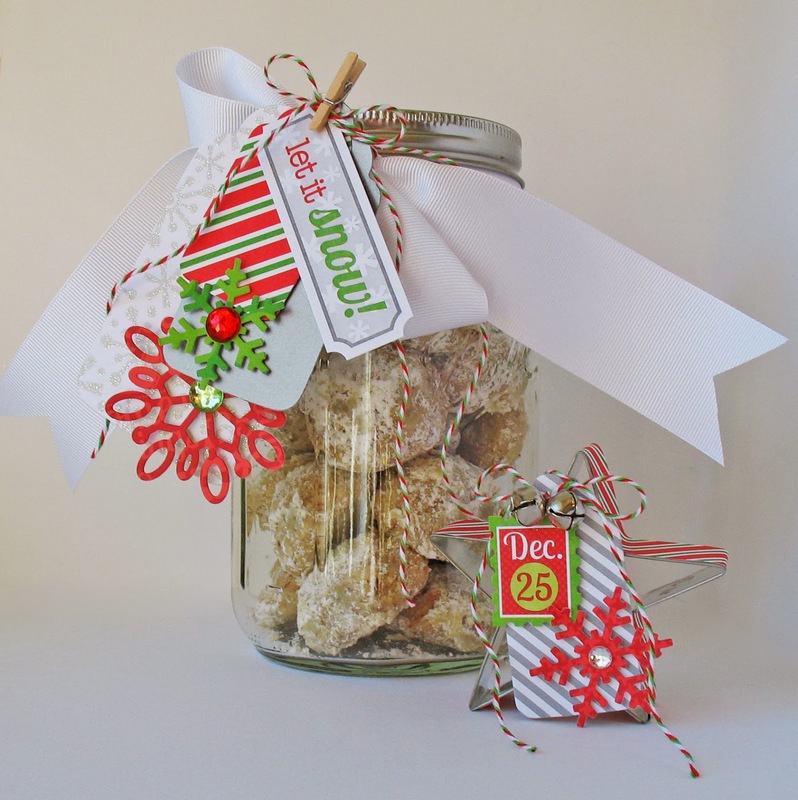 LOVE the jar idea...and the cookie cutter is too cute! Those cookies look so yummy. Fun cookie jar with that adorable DP and adorable cookie cutter. 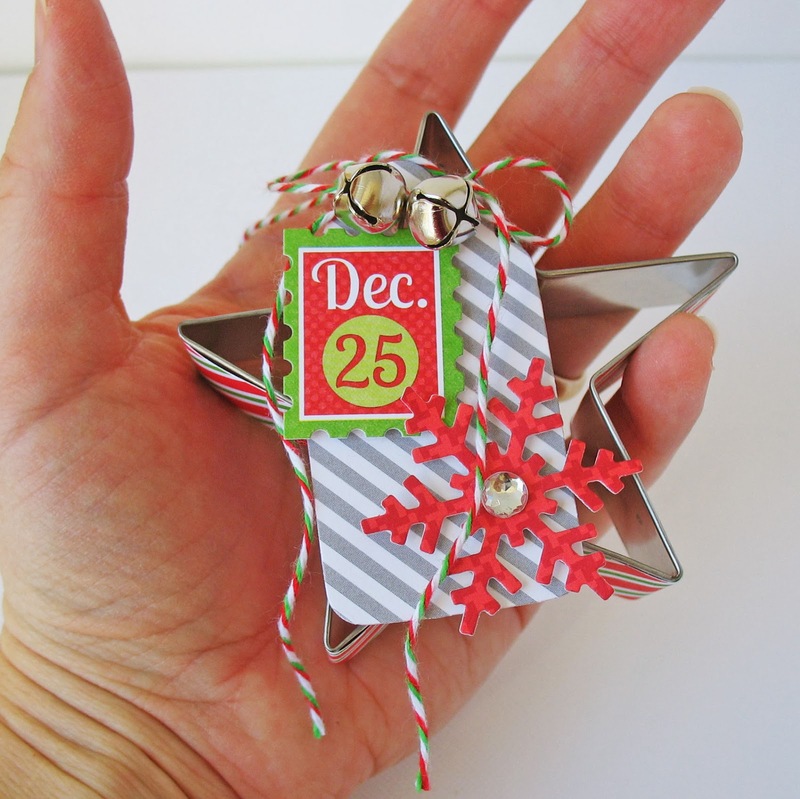 Fun Christmas inspiration. 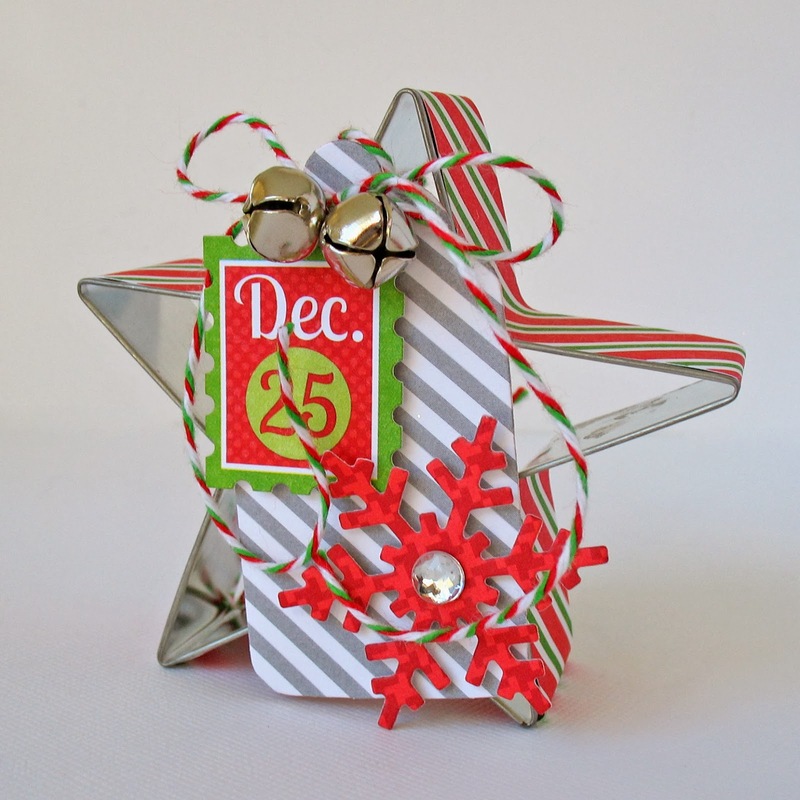 LOVE the cookie cutter ornament, Kathy! I think I'll be making some of those with my kids this year! Very nicely done! Thanks for being so inspiring! Such a nice idea. I love homemade gifts and this one is decorated so pretty. Thanks for sharing and Merry Christmas to you.